Emil Ferencik, 95, a Foxboro resident of 66 years passed away after a short period of declining health on Tuesday, February 5, 2019 at Norwood Hospital surrounded by his loving family. He was the beloved husband of Margery (Doherty) Ferencik who predeceased him on April 18, 2000. Born in Endicott, NY on September 24, 1923, he was the loving son of the late Frantisek and Sidonia (Herceg) Ferencik. He was educated in Endicott public schools and was a U.S. Army WWII veteran. Following his military discharge, he went to college on the GI Bill and attended Pratt Institute and was a graduate of the Rhode Island School of Design. 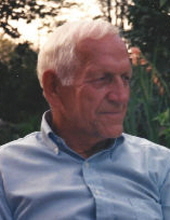 He worked for many years as a specifications writer for W. Chester Browne & Associates, a Boston architectural firm, and retired as an employee of the Town of Foxboro. An accomplished artist, he also enjoyed all aspects of gardening and he found great peace working in his yard. In his younger years he enjoyed hosting pool parties for family and friends amidst his lovely flower gardens. He was a communicant of St. Mary’s Church of Foxboro and a former member of the St. Mary’s Knights of Columbus and the Foxboro American Legion. He is survived by his devoted children Mark Ferencik (Beth) of Foxboro, Jeanne Coleman (Thomas) of Naperville, IL, Richard Ferencik (Lynne) of Plainville, Mary Cushman (Brian) of Plainville and Elizabeth Ferencik (Allen Duquette) of North Attleboro. Also survived by his grandchildren David Ferencik (Meghan) of Foxboro, Anne Aho (Andrew) of Worcester, Wendy Coleman of Naperville, IL, Jennifer Coleman of Madison, WI, Matthew Ferencik (Ashley) of Worcester, Lindsey Ferencik of Plainville, Jonathan Cushman of Quincy and James Cushman of Clovis, NM and his three great-grandchildren Jacob, Edith, and Evelyn Ferencik, all of Foxboro, and many nieces and nephews. He was predeceased by his brothers Frank, Louis, Joseph, Paul, John, Timothy and Richard and his sisters Ethel Rossi and Pauline Melvin. He is survived by his brother Edward Ferencik (Mary) and his sister-in-law Stephanie Ritter, all of Endicott, NY. Relatives and friends are kindly invited to attend a calling hour from 8:30 AM to 9:30 AM on Wednesday, February 13 at the Roberts and Sons Funeral Home, 30 South Street, Foxboro. A Funeral Mass will be celebrated at 10 AM at St. Mary’s Church, 58 Carpenter Street, Foxboro. Interment to follow at Knollwood Memorial Park, Canton. For additional information please contact 508 543-5471. To send an on-line condolence please visit the funeral home web site at www.robertsandsonsfuneralhome.com. The family wishes to thank the staff of the Doolittle Home who provided many years of loving and attentive care for Emil. In lieu of flowers donations may be made to the Foxboro Senior Center, 75 Central Street, Foxboro, MA 02035 or St. Mary’s Parish, 83 Central Street, Foxboro, MA 02035. "Email Address" would like to share the life celebration of Emil Ferencik. Click on the "link" to go to share a favorite memory or leave a condolence message for the family.